Palestinian terrorists have launched about a thousand homemade Qassam (or Kassam) rockets at Sderot and other towns and Kibbutzim around Gaza since 2001. 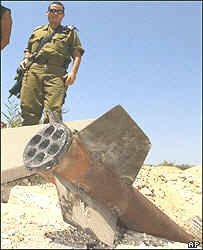 In June 2006 alone, about 89 rockets fell in the western Negev. The rockets keep getting larger and more lethal. The current version has a range of 10 km and carries a payload of 10 KG of explosives. Qassam development has gone through several phases, as the initially almost harmless devices developed into lethal weapons. On June 29, 2006, a Qassam that was apparently a new model landed in the city of Ashdod. Remains of a dud two engine or two-stage rocket were found. Qassam rockets are named after the Izz ad-Din al-Qassam, a Syrian Islamist agitator of the 1930s whose death in a battle with the British touched off the Arab Revolt (The Great Uprising) in Palestine. According to the Hamas, the Qassam rocket was first developed by Nidal Fat'hi Rabah Farahat and produced under the direction of Adnan al-Ghoul, known as the "Father of the Qassam," who was killed by the Israeli army in October 2004. Qassams were first fired at Israel beginning in October 2001. However, all landed inside the Gaza Strip. The first Qassam to land in Israeli territory was launched on February 10, 2002. The first time an Israeli city was hit was on March 5, 2002, when two rockets struck Sderot. Over a thousand rockets had been launched by the end of June 2006. As Hamas gained power in Gaza, large numbers of rockets began landing in the Western Negev in March of 2006: 49 in March, 64 in April, 46 in May, and about 90 by the end of June. Three models of Qassam are known (not including the new two engine model). The rocket has a lcylindrical body containing the engine with a small war head with conical detonator. At the rear there is an ejection nuzzle and four small stabilizing fins. The middle part of the rocket contains the engine; the front part is the warhead and detonator. The rocket casing is made of iron with a width of 2.5-3 millimeters. Groups other than Hamas have lesser numbers of home made rockets such as the Al Quds and Al Quds 101 of Islamic Jihad, and the Al-Nasser rocket of the Popular Resistance Committees. Palestinians have fired at least one Katyusha rocket into Israel and claim that they have a quantity of Grad rockets. If these were your children, what would you expect your government to do??? Decent people demand justice for Sderot! This site provides resources about Zionism and Israeli history, including links to source documents. We are not responsible for the information content of these sites. Zionism - Definition and Brief History - A balanced article that covers the definitions and history of Zionism as well as opposition to Zionism and criticisms by Arabs, Jewish anti-Zionists. Labor Zionism - Contribution of Labor Zionism to the creation of the Jewish state, and problems of Labor Zionism in a changing reality. The Middle East from a secular view. Israel-Palestina - (Dutch) Middle East Conflict, Israel, Palestine,Zionism... Israël-Palestina Informatie -gids Israël, Zionisme, Palestijnen en Midden-Oosten conflict... Israeli-Palestinian conflict from a European perspective - Dutch and English. Wikipedia article about Zionism - A comprehensive article including the history of Zionism as well as links to specific topics and articles about anti-Zionism.